Barca is a recent commercial chess variant. The game was invented by Andrew Caldwell, and appeared in 2011. There is a website on the game by its maker: playbarca.com, where you can find the rules, pictures of sets, information how to buy a set, the possibility to play the game online in an applet, answers to several questions on the game, and more. The game costs currently (february 2012) 39.95 dollars, including a large mousepad game board of size over two and a half square feet (that would be almost a quarter of a square meter), and twelve animal pieces. See the playbarca.com website for some pictures and more information. The game is played on a 10 by 10 board. Four of the squares are marked, and are considered to contain a watering hole: d4, d7, g4, and g7. 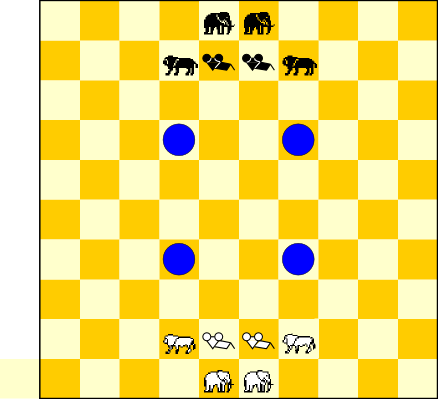 Each player has two elephants, two lions and two mice. Pieces do not take other pieces. Their movement is as follows: mice move like rooks, lions move like bishops, and elephants move like queens. Like their chess counterparts, the pieces cannot jump over other pieces. A mouse is afraid of a lion of the opponent; a lion is afraid of an elephant of the opponent, and an elephant is afraid of a mouse of the opponent. An animal may not move to a square that is adjacent (horizontally, vertically or diagonally) to an animal it is afraid of. In addition, if an animal is adjacent to an animal that it is afraid of, then it must be moved by its owner, i.e., the owner may not move another animal. In the special case that more than one animal is adjacent to an animal it is afraid of, the owner may choose which animal to move. One wins the game by occupying three of the watering holes with own pieces. The opening setup is shown below.